Joan writes about the Japanese invasion into China during the 1930s. I am fifteen years old. Fifteen years ago I was not, now I am—fifteen years from now—who knows? It gives you a queer feeling—your birthday . . .
P.S. Italy and Germany and Japan have a triple alliance now—whatever that means. And the Japanese had a peace assembly at Tokyo this week and are still killing people in China—nice world, isn’t it? Sarcasm masks her horror at the destruction wrought on civilians. I had a horrible dream about war again last night. In my dream I could see the countries of China and Japan spread out before me on a map. I could see people milling about in both countries and in the eyes of the Chinese, in all the eyes, there was a hurried bewilderment and there was a horror in my heart. Someone explained to me what was happening. “The Japanese are too many to fit into their own country so they are sending many of their people over to China.” And I could see it happening—the crowds of people hurrying over the narrow strip of water to China and the ever-thickening bewildered crowds in China, hurrying nowhere. “But,” I asked, “What will happen to all the Chinese—there are too many!” The answer came—slowly and surely, “They will be killed—deliberately and quickly—every one.” And I shouted at my dream, “But they can’t do it—they’re human beings—the Chinese!” And the words were repeated, “They will kill them—everyone.” And an awful horror filled my mind and I saw the people—all of them, hurrying faster—and faster—to nowhere. And faster! Joan wrote this entry shortly after the horrific Nanking massacre and mass rapes inflicted on the Chinese by the invading Japanese army. She then sees a newsreel about the Japanese bombing of the Panay.
. . . Last night we went to show and saw Norman Alley’s Bombing of the [USS] Panay. Pictures before and after and all. I wonder how he knew when he made them that those pictures would be so important. An historical document—the paper says. Here is the very newsreel she saw. Several years later, the U.S. continues to pay attention to China, even before it entered World War II. Joan starts out this passage in a funny way, since she has a cold, but then she hears a news report.
. . . Sprig is cub. . . . I hab a slight cod id de dose as you cod see. . . . Mom’s and Dad’s wedding anniversary. . . . Father and I were sitting listening to the “China War Relief” program and I was knitting. The China participation in World War II was in the New York Times today. 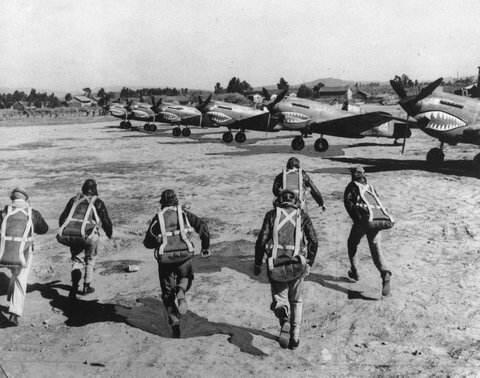 The Flying Tigers were an American pilots who fought for the Chinese before the U.S. officially entered the war. But recently a graveyard containing the remains of Chinese personnel who supported the Flying Tigers was found on a garbage strewn hillside. Graves had been disturbed. Many Chinese are angry about this desecration. You can see more about the Flying Tigers in this newsreel. The desecration of graves is a universal taboo. The commemoration of the dead is held as a dearly sacred rite in all cultures. This is Joan’s reflection on visiting a statue to the Unknown Soldier from World War I (the “Great War” in a Chicago park when she is 14 years old. This is Memorial Day and it rained. Daddy and I went out for a walk and when it rained went under a tree near the statue of the Unknown Soldier. He looked so lonely there in the rain (the Soldier, I mean), and there wasn’t even a wreath to mark the day. It seemed so pitiful. So I picked a little flower from the tree and ran in the rain to lay it at his feet. And I’m sure he knew I did it and was glad that someone remembered him on this day. It was only a little flower, but I’m sure it meant as much as a wreath. I’m glad I did it, as I’m sure the Soldier is . . . Here is a classic scene from the John Wayne movie, Flying Tigers, from 1942.